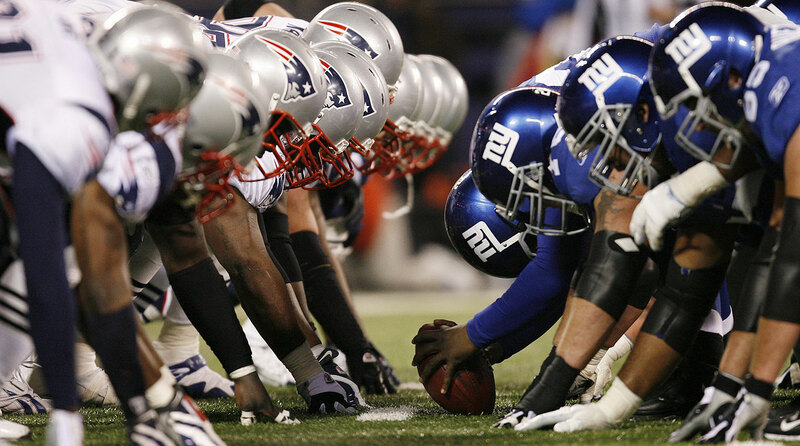 On Sunday, the Patriots play at the Giants for the first time in the regular season since a momentous Saturday night in December 2007. Bill Belichick is 1-3 as a head coach against Tom Coughlin and Eli Manning. The first time they met was on this cold night in 2007, and it’s also the only win for Belichick in the four games. It was one of the most dramatic regular-season games in the 96-year history of the NFL. I spent time this week revisiting it with some of the characters in the play—in part because the Patriots (8-0) again enter the game undefeated and the 5-4 Giants again play the role of underdogs, as they have in all four previous Belichick-Coughlin meetings. The setup: Week 17, 2007. The Giants clinched a playoff berth the previous Sunday with a win at Buffalo and, at 10-5 entering the final game of the season, their playoff position or first-round foe could not change. Still, Week 17 against New England was a pretty big game. The Patriots, 15-0, aimed to be the first 16-0 team in NFL regular-season history. 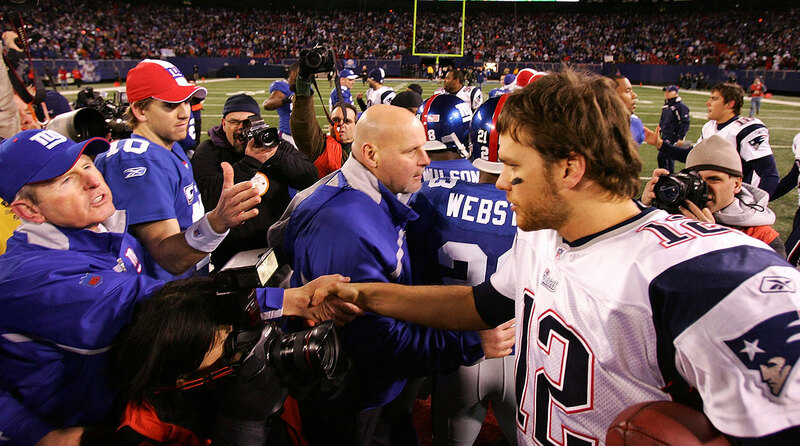 The Giants and Patriots met in the final game of the 2007 season, one month before playing each other again in Super Bowl 42. 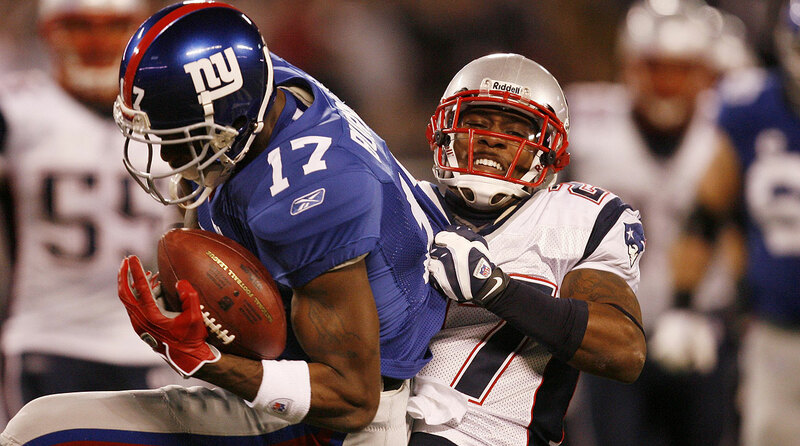 Ellis Hobbs and the Patriots had a hard time stopping Plaxico Burress, who finished with a pair of touchdowns. The game see-sawed, but the Giants went up 28-16 on Eli Manning touchdown passes on the last drive of the first half and the first drive of the second half. Eleven minutes to play. Giants, 28-23. New England, second-and-10 at their 35. Brady sent Randy Moss deep up the right sideline and high-arced a pass 37 yards downfield. Just short. Off Moss’ fingertips. 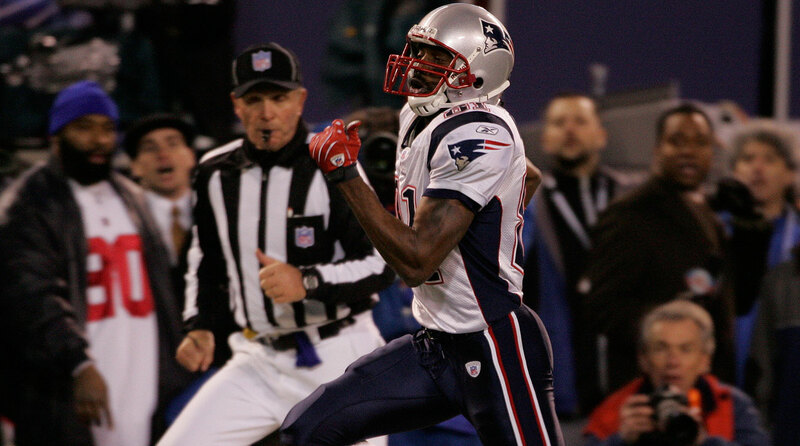 Randy Moss set the single-season receiving touchdown record with this 65-yarder against the Giants. His mark of 23 still stands today. The 65-yard touchdown pass, with Moss streaking down the right side and catching it in perfect stride, put the Patriots up 31-28. They traded touchdowns to make it 38-35, and the Giants’ onside kick with a minute to go was recovered by Mike Vrabel. Ballgame. Brady, Manning and Coughlin will meet again on Sunday afternoon in New Jersey. The next day, John Madden left Tom Coughlin a voicemail. In the Giants’ first meeting in preparing for the wild-card game against Tampa Bay, Coughlin played the message to the team. Back to 2015. Pats-Giants, Meadowlands, 4:25 p.m. ET, Sunday. Rex Ryan (right) did not hide his emotions during Thursday's game, his first against the Jets after they fired him at the end of last season. 2. Ronald Darby, cornerback. Drafted as the 50th player overall last spring. 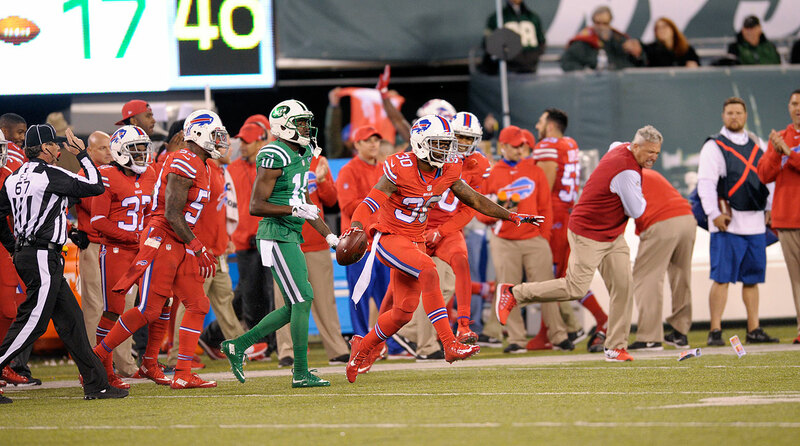 Darby plays strong and confident and incredibly competitive for a rookie, and he knocked three Ryan Fitzpatrick passes away on the night, two of them that would have been third-down conversions. Another example of a maligned front office—deservedly, for some errors—coming up big for this team. 3. LeSean McCoy, running back. Acquired in trade from Philadelphia. Nineteen carries, 112 yards against the best run defense. Picked a great time for his best post-Eagles game. 4. Rex Ryan, coach. Signed as the new coach Jan. 13. Sometimes nutty guy with nutty ways, but he had his team ready to play Thursday night—and he had his very undermanned team ready to play. Lots of injury-related absences, including Kyle Williams and physically ill Mario Williams. Said Rex postgame: “Pretty satisfying. Now that I can talk the truth, it’s like being dumped by some hot girl that you had the hots for. That’s really what it feels like. Hey, you move on. But every now and then they call you back. But they can’t get you back.” The man was on fire in his postgame presser. Whatever you think of Ryan, he does make the game fun. This was a fun night, the kind of night that was good for football. America has to be glad it stayed up for it. Shaquil Barrett, linebacker, Denver (number 48). Forty-eight is a strange number for a linebacker. It shows the tenuousness of Barrett’s existence in Denver as a 2014 undrafted free agent, when he was a bit of a roly-poly but very athletic sackmaster coming out of Colorado State. Our Robert Klemko profiled his body change this week—a really cool story. Barrett is newsworthy this week because he replaces Demarcus Ware (out with back injury) rushing the passer for Denver in the Sunday's game against Kansas City. The Chiefs are rallying and rested, coming off a bye, and no game’s a gimmee for the Broncos. As a backup, Barrett has 3.5 sacks and should be an impact player against a vulnerable offensive line. Shaun Draughn, running back, San Francisco. Carlos Hyde, Reggie Bush, Jarryd Hayne—all on the team in September, and all gone now, at least for the moment. Draughn gave the Niners 58 rushing yards in 16 tries, and with the Niners on their bye this week, you might still be able to sneak him onto your team for the last seven games. —Giants defensive end Jason Pierre-Paul, on the specter of facing Tom Brady on Sunday. 1. Arizona at Seattle. Bruce Arians is right: When Carson Palmer plays, the Cardinals can beat anyone, anywhere. The best deep passer in football knows he’d better have some good stuff in the gameplan this week for his tight ends, with the deep secondary skills of the Seahawks. Expect a really good game Sunday night. 2. The Vikings, trying to keep pace with Green Bay. A Week 11 showdown with the Packers awaits Minnesota. But first, the Vikes are off to Oakland. Weird schedule quirk: If the Vikings win, they’ll be 7-2, and none of the seven wins will have come against a team over .500. 3. Eddie Lacy. Mike McCarthy named James Starks his number one back the other day. Lacy said the ankle that bothered him early this season is fully healthy. Why the nearly yard drop in yards per carry this year for Lacy? He looks a bit heavier, and I think he’s not running as hard as last year. Maybe the demotion motivates him. 4. Another must win for Dallas. Cowboys have lost six in a row without Tony Romo, who should return next week in Miami. How many times can Dallas have a “must win” in the same season? Well, at least one more. I’ll go out on a limb and say if the Cowboys lose in Tampa on Sunday and fall to 2-7, they won’t make the playoffs. What a gutsy call! 5. Another long Sunday in Wisconsin for the Lions? Detroit hasn’t won on the road against the Packers in 24 years. I mean, the last Lion win in Green Bay came pre-Favre. Mike Tomczak was the quarterback that December day in Green Bay, and the late Lindy Infante the coach, and the wind-chill temperature was minus-18. Brett Favre was inactive that day, the third quarterback for Atlanta behind Chris Miller and Billy Joe Tolliver. 6. The LA Story. After league meetings this week in New York trying to get more clarity on which team or teams will eventually play in Los Angeles, there will be headlines this weekend. I’m just not sure what they’ll be. My guess: Owners Likely to Push Off Final Decision Until March Meetings. 7. Big Ben’s big foot. Early word was Roethlisberger would miss two to four weeks with a mid-foot sprain. Now there are rumblings he might try to come out of the boot Sunday and play against Cleveland. I doubt it, but stay tuned. Smartest move: Keep Roethlisberger out this week in a winnable Landry Jones games, and next week with the bye. 8. Marcus Mariota against some great linebackers. Twice this season in six games, Mariota has thrown four touchdowns with no interceptions in a game. And he’s a threat to run. Luke Kuechly is a superb sideline-to-sideline run defender, obviously, as is Thomas Davis. Kuechly missed practice with a sore ankle, which could be a factor against Mariota’s change-of-direction skills. Might be an interesting game Sunday in Nashville for the 8-0 Panthers. 9. The Colts, hunkering down and hoping nothing else goes wrong. Indy’s on the bye. That doesn’t mean, however, that some further disaster can’t befall the team this weekend. 10. Greg Hardy. I mean, why not? Something always seems to be happening with the guy.